This morning's temperature outside: -7 degrees. Tomorrow's alleged high for the day? A whopping five degrees. Nothing is happening yet as far as showing any signs of spring.... temperature-wise anyway. All we can do is keep making hot soup and baking good bread, and try to keep ourselves (and our bellies) content until change is in the air and we have something to look forward to again. Right? Bake away, my friends....Bread, that is. Fill a small bowl with the water, sprinkle your yeast on top and let sit for ten minutes. Add your salt and olive oil to the water and whisk it all together. In a large mixing bowl combine both white and rye flours. Add only 2 tablespoons of the caraway seed, reserving the last tablespoon. At this point, I chuck everything into my KitchenAid mixer, fitted with the dough hook, and mix it all up on medium speed until the dough pulls from the sides of the bowl (about five minutes) Once this happens, cover your bowl with plastic and throw a dishtowel over it. Let it sit for 2 hours, or until you are ready to bake it. You could also mix everything by hand, if you're in need of some exercise. Preheat your over to 425 degrees for about 20 minutes. Take your bowl of dough and gather it into a loaf-shape. No need to let it rise again. 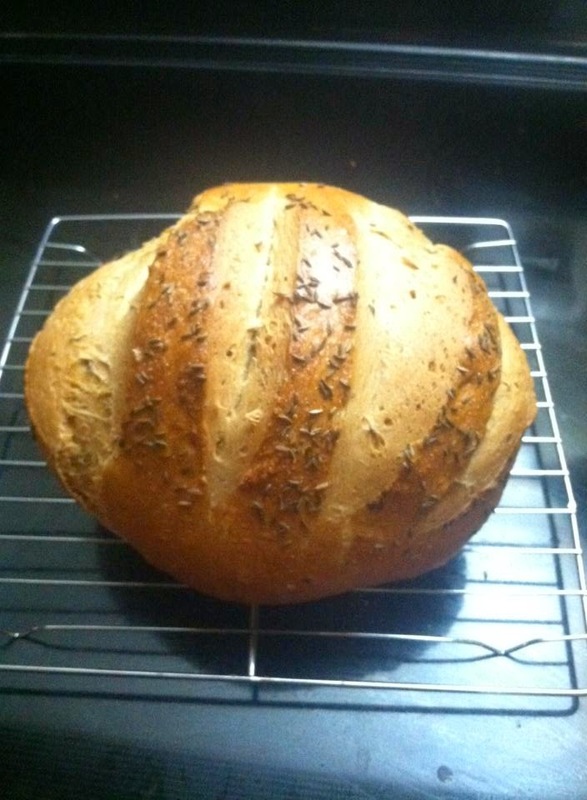 Brush the loaf with beaten egg white and sprinkle on the remaining caraway seed. Put your loaf directly onto your baking stone that has been heating in the oven, or onto a greased baking sheet, and bake at 425 degrees for 35-40 minutes. Let it cool before slicing if you can help yourself...it makes for better sandwich slicing. Oh by the way...apparently, the word "lukewarm" turned up around the 14th century as a description for "slightly warm." Within a couple of centuries, it also took on a figurative meaning, to describe "lacking enthusiasm." "Luke" was derived from "lew," "lewk" or "leuk," of which meant "tepid" or slightly warm, in Middle English. So now you know.